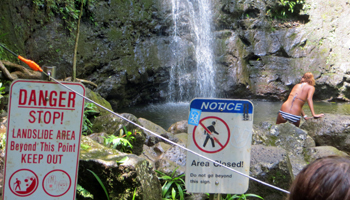 Hike Manoa Falls Trail for a Filthy Good Time in Honolulu. 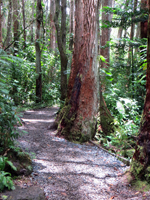 Manoa Falls Trail Delivers Adventure to All Seekers! Manoa Falls is a beautiful waterfall more than 100 feet tall at the foot of the Koolau Mountains in Honolulu’s picturesque Manoa valley. As far as I know, it’s the tallest accessible waterfall on Oahu. 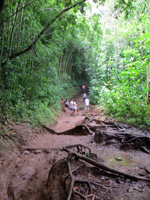 And in my judgment, the trail that gets you there is possibly the easiest hike on Oahu – but it’s also possibly the muddiest! Paradise Park is now closed except for a snack shop and restaurant. 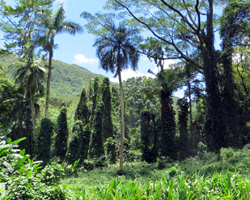 A round-trip hike to Manoa Falls from the Treetops Restaurant parking lot (at the old Paradise Park) is just a little more than one mile through a lush and diverse tropical rainforest. 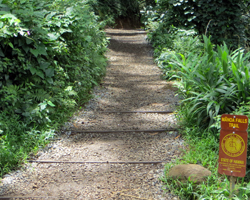 The slope is gradual for most of the trail’s length, and the trail is well maintained. 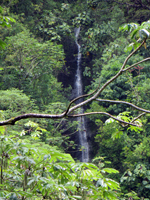 As the name indicates, Manoa Falls Trail (which is connected to the much longer Na Ala Hele Trail system) ends at a waterfall at the back of Manoa Valley. And it isn’t called a rainforest for nothing! Like most waterfalls on Oahu, this one has no source other than rainfall runoff from the surrounding mountains – and Manoa Valley is known for having prodigious amounts of rain. So, on one of those rare, beautifully-sunny days after a week without rain, the trails may be dry, but the waterfall may be no more than a trickle. On the other hand, a good heavy downpour will really give you an experience to remember! Although this trail is well maintained, there’s just no way to keep all that rain from turning everything to mud. Therefore, I recommend that you plan to get dirty and then enjoy executing your plan to perfection! Wear your worst clothes and a pair of reef-walking shoes. A lot of people go barefoot, but there are a lot of rocks and gravel in the trail, which could make that a painful proposition. You could wear flip-flop sandals, but they’ll probably just stick in the mud or flip mud all up and down your back. Reef walkers or a disposable pair of trashy shoes are probably your best options. There’s a hose in the parking lot that you can use to rinse yourself off. Just bring some trashy towels to dry off and a change of clothes. Bring some plastic bags to carry your muddy gear, and you’ll be able to get back into your car without a worry. For all you film fans: part of the hit ABC series LOST was filmed at Manoa Falls and the adjacent Paradise Park; and part of Jurassic Park was filmed at this Stream. Speaking of your car, it’s not possible to park your car at the trailhead, so you can park on the street down in the neighborhood for only the cost of walking an extra 500 yards (or so). Or you can park at the old Paradise Park. This option will cost you $5 (or $3 for kamaaina). Although I would normally complain about this cost, the availability of the hose and clean bathrooms makes this fee worth paying. First of all, stay on the marked trails. All that rain we’ve been discussing means the rocks are too slippery for climbing. It also means that wandering off the trails might cause the saturated ground to slide. There are warning signs posted on the trail. Please heed them. Keep your eyes – not hands – open for green and black poison dart frogs. Manoa Valley is one of the only places where these 3/4" tree frogs can be found. And although I have seen people hold these critters in their hands, I am also aware that they are called poison dart frogs because the toxin secreted from their skin has been used by indigenous hunters to make deadly poison-tipped projectiles. If you plan ahead and use your head, Manoa Falls can be a favorite Hawaii vacation adventure you’ll fondly remember forever!